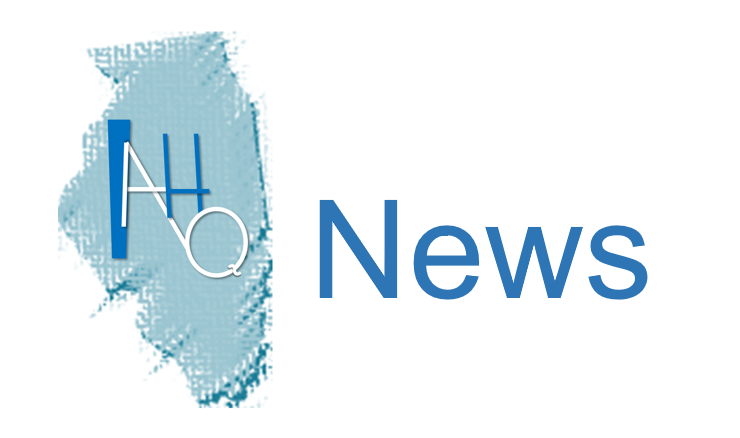 IAHQ News is a monthly communication to members and non-members of the Illinois Association for Healthcare Quality (IAHQ) about upcoming events and resources available to healthcare quality improvement professionals in Illinois and the surrounding areas. To submit items that will be of interest, please send an email to IAHQ.net@gmail.com. IAHQ’s 2018 Annual Conference will be held on Tuesday, May 8, 2018, at the NIU Naperville Campus, 1120 E Diehl Rd, Naperville, IL 60563. Participants can expect an expanded conference experience with a pre-conference evening reception and keynote presentation, more interactive conference-day presentations and panels, time for networking, CPHQ continuing education credit, as well as more ways to engage with and learn from one another through stories and posters on QI projects. Please save the date and be prepared to respond to the call for posters when it is announced later this year. Accepted posters will be judged by peers during the conference and receive awards. It’s not too late to join the planning committee. If interested, email: IAHQ.net@gmail.com Stay tuned for planning updates! The IAHQ Board recently conducted a strategic planning meeting to discuss ways the association may increase value to you, our members and potential members. Although some of the changes will take time to complete, such as a new website, you will see aspects of this plan unveiled through the end of 2017 and during 2018, including a greatly enhanced conference experience, a new webinar series, increased communications, and access to new resources. Details in future IAHQ News. In the near term, IAHQ will make extensive use of IAHQ News, e-Blast system and LinkedIn to provide you news, resources and other information to support your quality improvement goals while a new website is built. IAHQ will be careful to limit the number of communications you receive. Access to performance improvement resources and discounts from PCPI ( www.thepcpi.org ) – an IAHQ exclusive you cannot receive from any other state or national quality organization. Register for an overview of the “Measuring What Matters” initiative, which will serve as a precursor to the PCPI’s fall meeting panel session on meaningful measurement during which various groups will describe how they have determined what matters to their constituency and how they are going about addressing those gaps in quality measurement. A moderated Q&A and discussion period will follow. New PCPI Leading Practices Webinar: QI Lessons from the California Maternal Quality Care Collaborative: November 28 at 1 pm ET/12 pm CT/10 am PT, featuring David Lagrew, MD, Executive Director Women’s Services, St. Joseph HOAG Health. Register now! 1) Questions and sharing of lessons is strongly encouraged; solicitation of products or services is NOT (IAHQ has a zero-tolerance policy for solicitation – you will be blocked in the future). 3) Civil interaction is expected. Respect is the basis for all improvement work. If you are unclear what this means, think back to what your parents taught you. This includes: NO YELLING in your electronic communications. 4) Have fun and make new professional friends! Celebrate Healthcare Quality Week - October 15-21; Share Your Stories! Please celebrate Healthcare Quality Week (HQW), October 15-21, to recognize the contributions you, your healthcare quality team, and your organization make to improve quality and patient safety in Illinois for all our residents – friends, families and visitors. Please share (include photos) what you’re doing in the IAHQ LinkedIn Group Forum or send an email to info@iahq.net so we may feature in future IAHQ News. Visit the NAHQ website to download complimentary resources such as a press release template, poster, and sample posts. You may also order HQW items for giveaways and prizes from NAHQ. Apply for the John M. Eisenberg Patient Safety and Quality Award by October 30. The award recognizes major achievements by individuals and organizations to improve patient safety and healthcare quality. Each year, the National Quality Forum (NQF) and the Joint Commission recognize the best examples of individual, local, and national efforts to improve patient safety and healthcare quality through the prestigious Eisenberg Awards. These awards bring the quality community together to honor groundbreaking initiatives that are consistent with the aims of the National Quality Strategy: better care, healthy people and communities, and smarter spending. Submission are open through October 30, 2017. Awards will be presented during NQF's 2018 Annual Conference, March 12-13, 2018, in Washington DC. Pioneers in Quality (PIQ) is a Joint Commission program to assist hospitals on their journey towards electronic clinical quality measure adoption that includes educational programs (e.g., webinars for CEUs), a resource portal, recognition categories, an advisory council, a modified annual report, speaker’s bureau outreach, a peer – to – peer solution exchange, as well as having a strong focus on partnering with hospitals to provide the highest level of quality care for patients and their families. If you have a free resource or event that would assist IAHQ members in their QI or patient safety efforts, please let us know. Facilitates accomplishment of health system quality goals and implementation of quality improvement in operations, serving as an internal expert and consultant of performance improvement and measurement. Bachelor’s degree in Nursing, Public health, Healthcare Administration or other related field from an accredited university. Three or more years of experience in a healthcare setting with a preference of 2 or more years of experience in quality/performance improvement, healthcare database management and coding systems. A working knowledge of Joint Commission IOP and Patient Safety Standards and survey process. The Performance Improvement Consultant serves as a subject knowledge expert to those engaged in quality improvement work at Ann and Robert H. Lurie Children's Hospital of Chicago. As an internal consultant for all levels of the hospital, the Performance Improvement consultant establishes strong working relationships with interdisciplinary members of the health care team including the medical staff, nursing and other operational areas, administration, and support services by directing and coaching to successful achievement of identified goals. The Performance Improvement Consultant works closely with Senior Leadership as the lead facilitator in improvement activities that are strategically aligned with organizational goals. He/she plans and manages the corporate-level performance improvement projects, applies performance improvement science, and is responsible for oversight of data collection, data management, and data analysis, as well as for planning the operational implementation of selected solutions and control plans. Leading by example, he or she acts as a change agent who spreads the mindset of continuous improvement and systematically drives and implements improvement throughout the organization.